1. I don't just visit People.com too frequently, I hit refresh when I'm on People.com because I feel that strong a need for the latest info on the Robert Pattinson/Kristen Stewart cheating scandal. Not only do I not know Robert Pattinson or Kristen Stewart, I don't even like the Twilight movies. 2. I begin most of my sentences with, "Well, on Pinterest ..." When I'm not on Pinterest, I'm doing fun things like pasting wallpaper to the side of an old dresser, making concoctions with shredded chicken from the crock pot and removing the den doors. (Yes, I physically took down the doors to the den.) Last night, I washed banana out of my hair after reading about homemade hair masks on, what else, Pinterest. 3. Perhaps of greatest concern, I'm newly obsessed with memes. 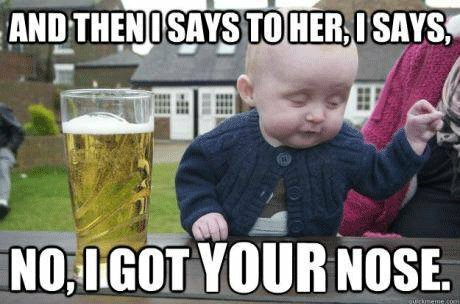 (At present, my favorites are "drunk" Irish baby and "Just describe your lunch to me!") I Googled how to put text on images in Photoshop. A lot of my evenings involve finding photos of the dogs, putting phrases on them and emailing said photos to the SO who is all of two feet away on the couch. If he doesn't pick up his iPhone in the evening, it's most likely my fault because he's tired of getting a notifcation when I send him Carat and Cassidy memes. I should also mention that I'm not good at this. * "Current signs" because it's not like this is a new phenomenon.